It’s CSA season again! This is our first year with the UUCC CSA, supplied by the Fellenz Family Farm but in the past, we’ve been a part of the Fellenz CSA distributed from Geneva, as well as Peacework Farm’s CSA based in Newark . Monday was the first distribution day, delayed from May 19th due the cool spring’s effect on the veggies. Typical of the early weeks in the season, we received a share chock-full of greens — mizuna, tat soi, a lettuce that’s name I’m blanking on, wild garlic, and broccoli rabe, plus a few stalks of rhubarb thrown in for good measure. The recipe is easily adaptable: you could swap out the rabe for spinach or another cooking green; use a different kind of mushroom; add more (or less) garlic or flavor things with different herbs; use vegetable broth instead of chicken for an entirely vegetarian meal; or leave out the pasta entirely for a strictly veggie dish. So whatever variant you choose, head to the local farmers’ market, roadside stand or make use of the goodies in your CSA share and get cooking. You won’t be disappointed. Cook pasta until al dente, according to package directions. While pasta is cooking, heat oil in a Dutch oven or large, deep skillet over medium heat. Add garlic and cook, stirring, about 20 seconds, making sure garlic does not brown. Add mushrooms and cook, stirring frequently, until browned and all liquid evaporates. Remove mushrooms from pan and set aside. Return pan to heat and add broccoli rabe and broth. Bring to a boil over high heat. 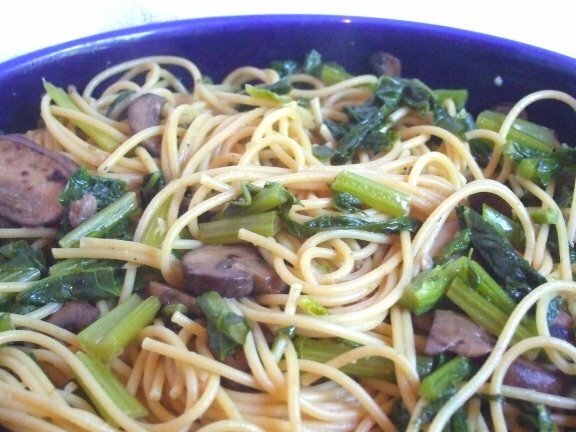 Reduce heat to medium-low, cover and simmer until broccoli rabe is tender, about 8 minutes. If needed, add more broth while broccoli rabe cooks. Add mushrooms and stir. Add salt, pepper, and red pepper flakes. Adjust seasons to taste; add drained pasta and extra virgin olive oil and toss until heated through. Top with cheese and serve.